It was a Monday afternoon when Monica and I found ourselves sipping delicious brews and soaking up the casual setting of the Beer Bank. 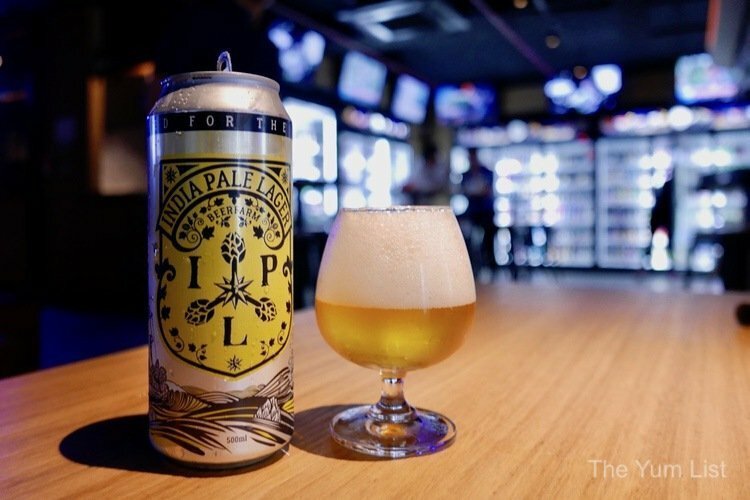 Located on Jalan Raja Chulan, Beer Bank acts as a paradise for those looking to enjoy a plethora of craft beer without any fuss or distractions. With its location at the back of a supermarket – go past the packing boxes and through the black drapes – Beer Bank might be considered a hidden bar. It would certainly make a sneaky little getaway; pretend you’re doing the grocery shopping but slip out the back for a cold one instead. Once inside the bar, the outside world feels miles away. 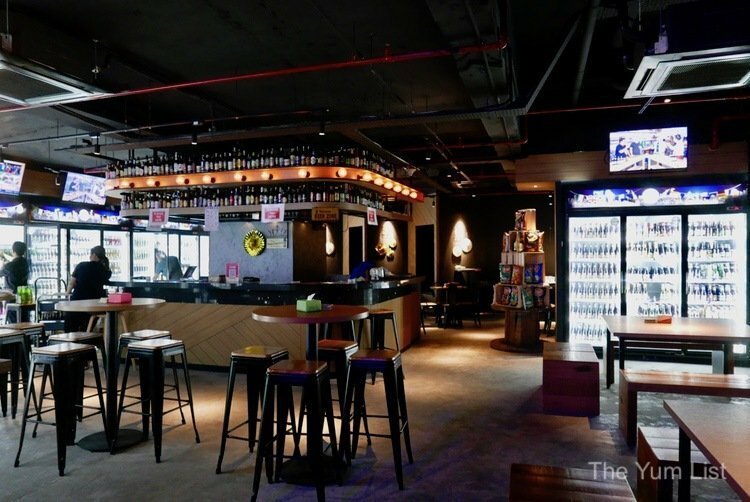 Complete with communal tables, several TV’s broadcasting a range of sports, a beer pong court, and over 300 varieties of bottled craft beers, it’s easy to lose track of time at Beer Bank. The concept behind Beer Bank is simple. 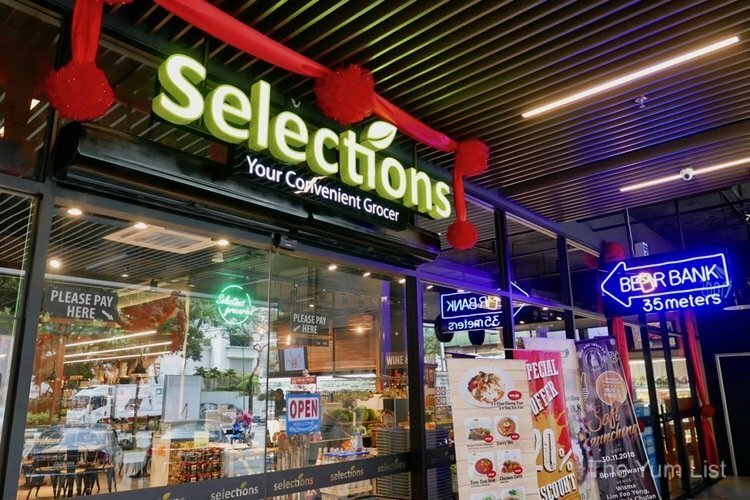 It is a self-service bar that is lined with fridges containing all the different beers and prices organized according to the country of origin. You are free to take a beer one at a time from the fridge or to select a few at once. If you go with the latter option, grab an ice bucket and to keep your multiple purchases chilled. The frequent complaint of “warm” beer in South East Asia will never be heard here, as, on top of the refrigerators and ice buckets, there’s also a glass fridge. As someone who spent her childhood tentatively opening the freezer (probably in search of ice cream) careful to make sure the chilling beer glasses did not fall out, I have to say the glass fridge was my favourite. This time though, I was happy to delight in the adult pleasure of grabbing an icy-cold glass making sure that every sip of beer was as chilled and refreshing as possible. A Malaysian beer drinkers’ paradise! Monica and I started our afternoon with an Italian organic beer ‘naBio (RM 25). Monica shared a story of how she travelled to the Birradamare brewery in Rome and discovered that a chef was one of the founding partners. This translates to the brews being made to be enjoyed with food. Every beer even comes with food pairing suggestions. Their most well-known range, ‘Na Biretta is a play on words as many youths will use this shortened phrase to order a beer. 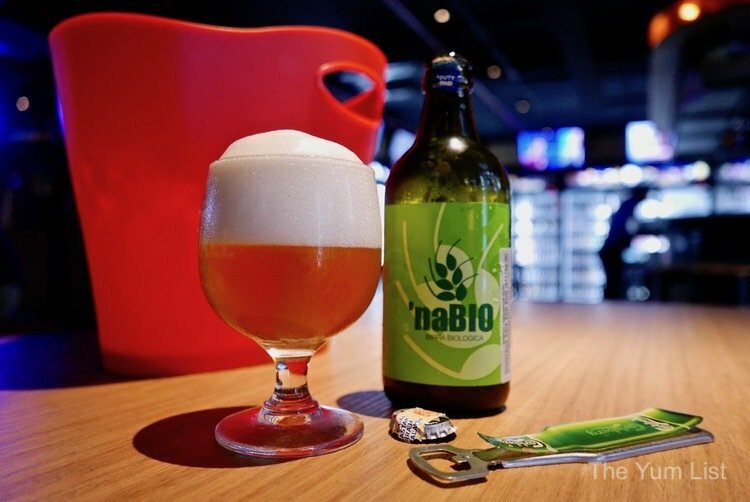 Bio in Italian means organic so the pun here is that ‘naBio’ is the short hand way of asking for an organic beer. This light beer with subtle hints of barley and mint and a dry finish would definitely have me asking for another too. Moving from Rome to Australia, our next beer is for experienced beer drinkers. It’s an Indian Pale Lager from Beer Farm Brewery (RM36). It is still light in colour and weight, but this beer is loaded with hops! Combined with the hops, this beer has a bitterness that complements the strong citrus notes that you not only can taste but smell as you bring the beer up for a sip. It’s a really nice and well-rounded drink for those looking to get a bit more adventurous, while still keeping things light. With two beers in our bellies, we were still building up our adventurous spirit and decided to stick to Australian beers but move from light to dark. The Holgate Brewery Company in Melbourne provided us with their Temptress Chocolate Porter (RM 34). Do not be fooled by the name; this beer is far from sweet. 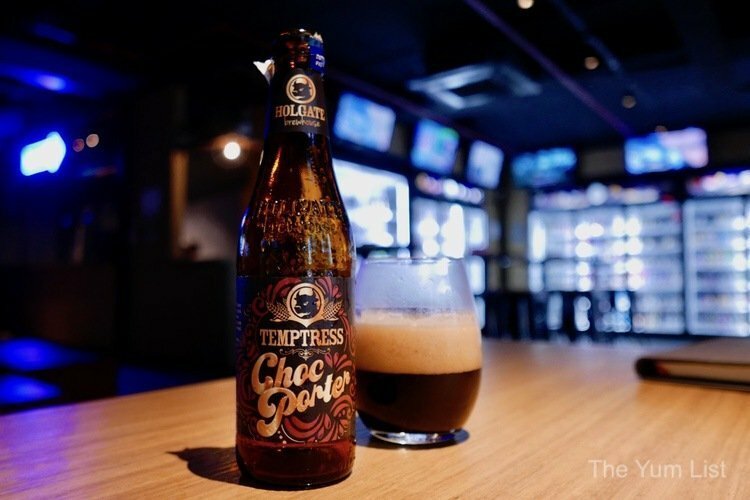 With smoky aromas, this beer is strong and almost nutty with just a hint of cocoa and vanilla coming through at the end to create a complex albeit fairly heavy beer. I was happy to have tried it but also would need to split a beer like this with a friend (thanks, Monica, always so willing to help out). We head back over to Europe to round out our afternoon with two beers from the perhaps the most famous beer drinking country in the world – Germany (Oktoberfest anyone?!). 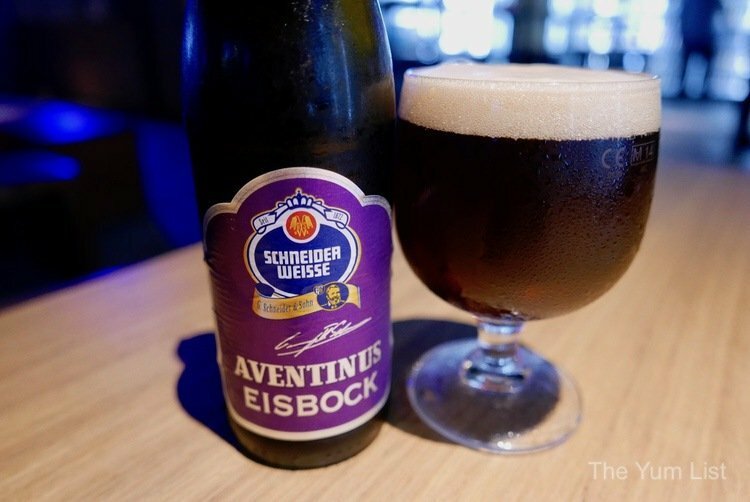 Aventinus Eisbock (RM 38) has a 12% ABV and to the nose has a strong smell of alcohol. This nut-brown beer leaves a small head, is light on carbonation and heavy on flavour. Dark raisin and dark sweet cherry, as well as a touch of candied dates, show up with warmth along a bed of smooth warming booze. Complex and of high quality, this beer packs a punch. 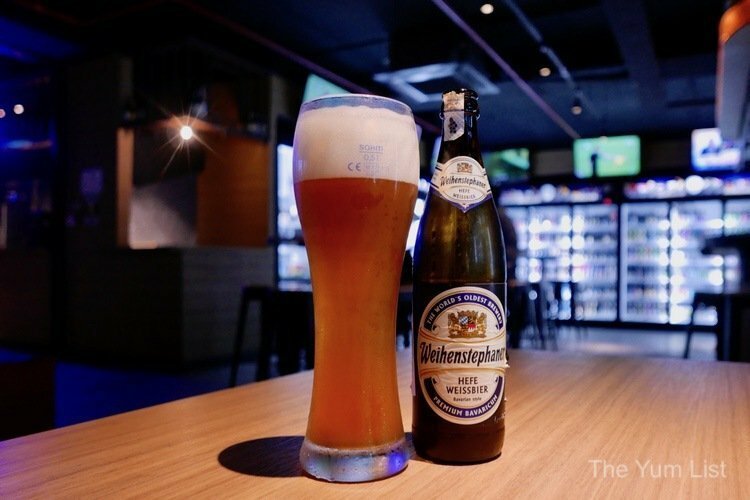 We end our afternoon with a bit of a history lesson, sampling a Hefe Weissbier (RM38) beer from the Weihenstephaner brewing company – the oldest brewery in the world! Having begun beer brewing in 1040, they have had plenty of time to perfect their beer. This amber wheat beer, pours with a white foam and smells of cloves and just slightly of banana. Full bodied, yet smooth to taste, this is a refreshing “cleansing ale” (as my father would say) that finishes off our evening of stupendous beers nicely. 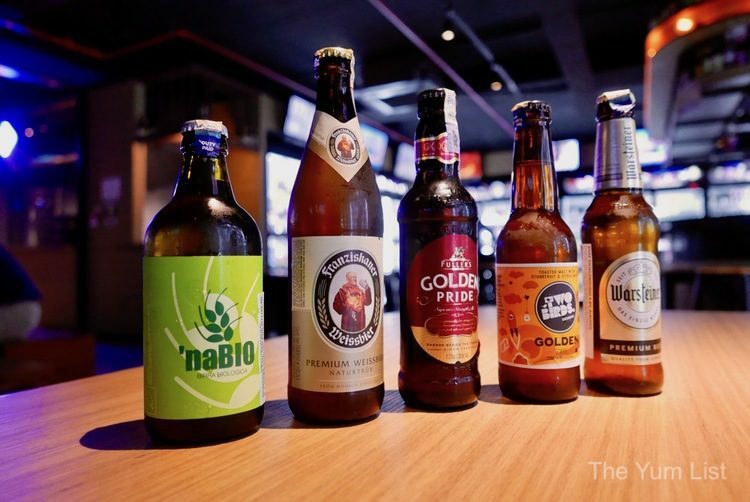 Reasons to visit Beer Bank KL: literally, hundreds of choices to suit every beer drinker’s taste (do give the ‘naBio a try); a cool atmosphere that cuts down on flash and ensures everything is done in order to best enhance the beer tasting experience; retail prices yet you get to drink in. Find more on KL’s booze scene here. Never heard of beer bank although I had few choc porters. My man would be happy in this place. Bottom up! Beer drinkers will love this place.